NCHSE and Precision Exams are offering industry-leading stackable pathway solutions for health science students. NCHSE and Precision Exams unite to offer next-generation health education products. NCHSE is the educational standard when it comes to innovation and quality in health science education. The NCHSE team of organizations and coalitions, all with vested interest in health science, is best positioned to help prepare healthcare employee candidates. Utilizing Precision Exams, health science educators receive powerful reporting tools they can use to improve their programs and evaluate their students’ understanding. The standards provided by Precision Exams are current and relevant and when implemented into coursework become a scalable and sustainable model. NCHSE is uniquely positioned in the nation to provide insight into healthcare industry advancements and develop innovative educational solutions that will help meet the demand for a high-quality healthcare workforce. 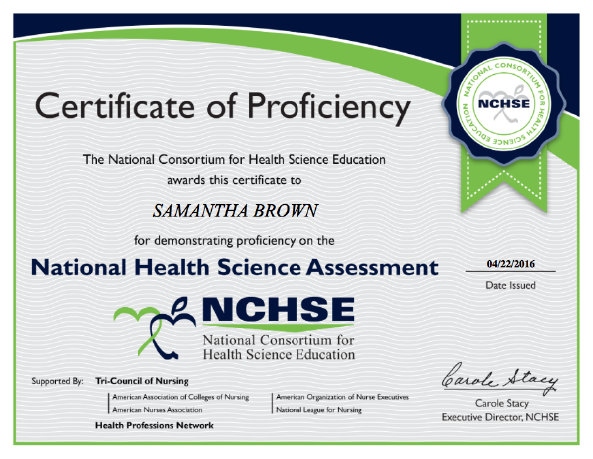 NCHSE is currently working with Precision Exams to build additional exams to help educators prepare the students who will work in the healthcare industry. Ensuring your students are prepared for careers in healthcare is more important than ever. NCHSE is now offering 15 stackable exams from dental assisting to sports medicine. These new exams provide a broader foundation to reach a wider audience of health science students and teachers while opening the door for greater and more direct industry and post-secondary engagement.